My wife and I would see the large statue of Jesus known as “Touchdown Jesus” when we drove between Dayton and Cincinnati. Sad to say, it was struck by lightning and burned. Here’s another article. I hope they rebuild it because I liked seeing it on the road side. 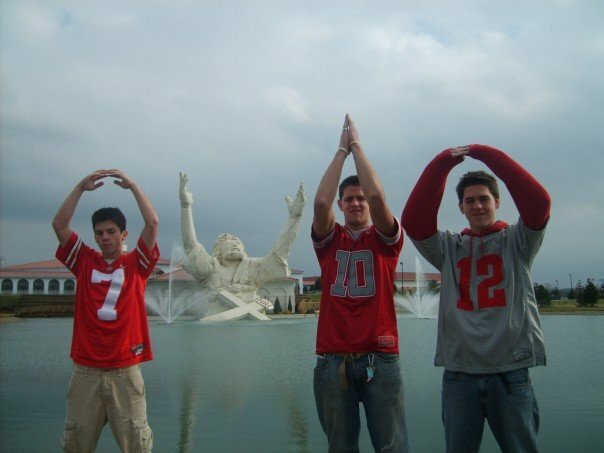 Just before our first date, my wife sent me this picture showing the statue being just right to be part of the Ohio State cheer. I must admit I missed it the first time I drove through. Oh well, I saw it later.